Our show features a comprehensive lineup of seminars & demos! Use the buttons below to find what interests you! You can also see our exhibitor list here. Please note, the content below contains details of our most recent show, for reference purposes. We will update the site with content detailing the upcoming show a few months prior to the event date. Amanda Morris, MS is a Sales Specialist for Purina Animal Nutrition. 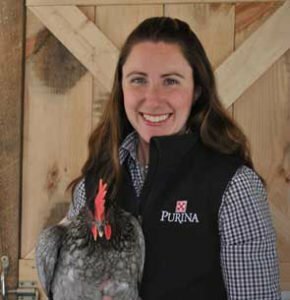 Her personal interest in poultry and professional experiences has allowed her to expand and develop a diverse background in poultry nutrition and management. Amanda specializes in developing nutritional plans for backyard poultry and incorporating that into personalized homestead plans. Scuba diver & long distance bicycle rider. Carol Quish is a horticulturist at the UConn Home and Garden Education Center. 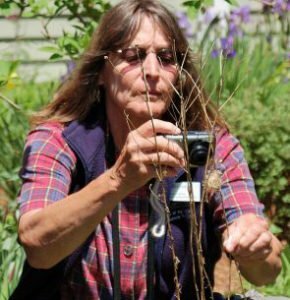 She provides plant disease diagnosis and insect identification, and answers plant and pest questions via a toll free phone line, email, and in person. Carol has a degree in Ornamental Horticulture and Turfgrass Management from UConn. She holds certifications in Advanced Master Gardener, Master Composter, and a CT Nursery and Landscape Association Professional. Dawn Pettinelli is an Assistant Extension Educator at the University of Connecticut. She manages the UConn Home & Garden Education Center and the UConn Soil Nutrient Analysis Laboratory. Both facilities provide information, testing and advice to homeowners and commercial clientele. Dawn has been a Master Gardener since 1986 and was the Master Gardener Coordinator for Worcester County Cooperative Extension in Massachusetts. A lifelong gardener, Dawn was also a horticulturist at Old Sturbridge Village. Award-winning container garden designer Deborah Trickett has worked in the gardening industry for over 30 years, starting with her first job in a greenhouse at age 13 until the present as the owner of The Captured Garden. Deborah works with clients throughout New England who want their homes to be beautiful, not typical. By combining unusual plant material and creative design ideas she creates gardens and containers that are truly one of a kind. Deborah Trickett is a Massachusetts Certified Horticulturist, and a Massachusetts Certified Landscape Professional. 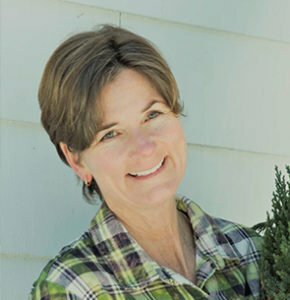 Deborah is a frequent lecturer on creative container gardening, speaking at the New England Spring Flower Show, The Connecticut Flower Show, the Newport Flower Show, as well as The Philadelphia International Flower Show. 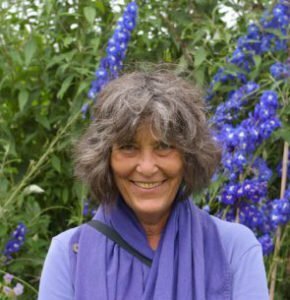 She has also shared her passion for perennials at the Perennial Plant Association Annual Symposium and she also teaches classes and workshops at the Arnold Arboretum in Boston. Her work has been featured in The Boston Globe, The American Gardener, Garden Gate and New England Home magazines as well as on the TV show New England Dream Home. Deborah’s work can also be viewed on The Captured Garden website at www.thecapturedgarden.com. Join Diane St John as she explains the life cycle of the monarch butterfly. 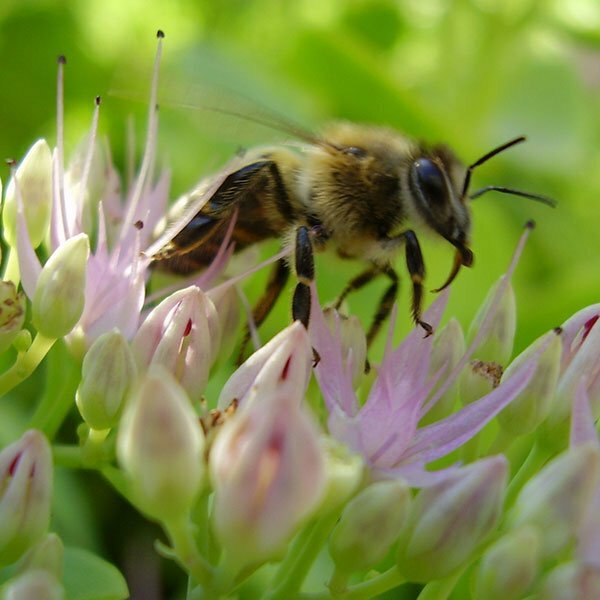 Learn how you can attract and raise them right in your own yard by using organic gardening techniques and planting the specific plants they (and so many other pollinators) love. 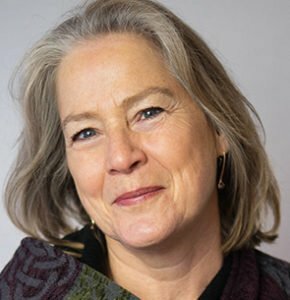 Diane St John is the manager of Natureworks Garden Center and has a BFA in Photography from Columbia College in Chicago and a Landscape Design Certificate from Naugatuck Valley Community College. After obtaining the Landscape Design Certificate from NVCC, the UConn Master Gardener certification, and an Accredited Organic Land Care Professional Certification through CT NOFA, she became increasingly aware of the overuse of synthetic chemicals on lawns and gardens. 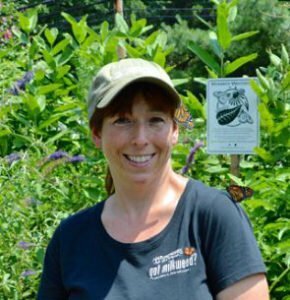 She became a passionate educator of organic land care practices and saw the decline of the monarch butterfly as a symbol of educating the public on why organic methods are so important. She hopes to inspire others to stop the use of chemicals at home and create a safe, beautiful, healthy environment for all. George Trecina earned his Bachelor of Science Degree in Landscape Design from the ‘The University of Connecticut’ and his Master of Landscape Architecture Degree from Cornell University. He previously received a Three-year Certificate in Commercial Art, Advertising from The Paier School of Art. 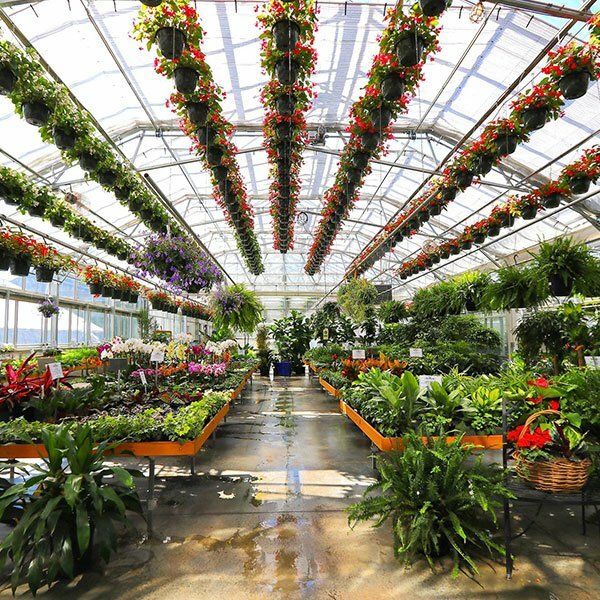 George Trecina’s horticultural experience came from Racker Florists, Meriden, Evergreen Nursery, Southington, Bell Nurseries, North Haven, Gledhill Nursery, West Hartford, Sunny Border Nurseries, Kensington and Vinny’s Home and Garden Showplace, Wallingford. 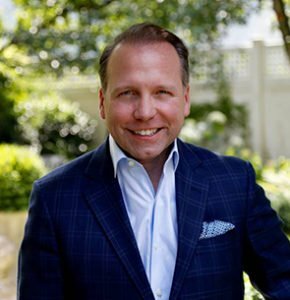 His landscape design experience has been with The Landscape Planning Office, Cornell University, Ithaca, NY, Peter Cascio Nursery, West Hartford, Edward Cape, West Hartford, TMR Associates, East Hartford, Kasper Associates, Bridgeport, State of Connecticut Bureau of State Parks and Forests, Hartford and Comstock Ferre & Co., Wethersfield. 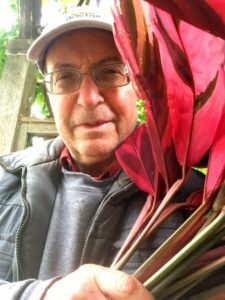 George Trecina has written articles on design topics for The Connecticut Gardener and The Meriden Record Journal. 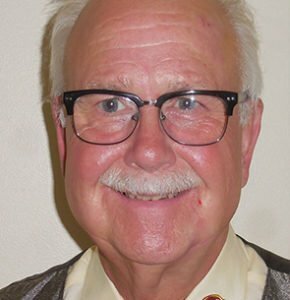 He has served as a landscape judge at The Hartford Flower and Garden Show, instructor of landscape design at Middlesex Community Technical College and has presented numerous talks to garden clubs and other organizations. For many years, George has hosted garden tours at the Land Design Gardens at his home in Meriden. Larry is a member of the Garden Club of Orange, CT Judges Council, and Creative Arrangers of CT. He is the recipient of numerous top awards for his creative designs and proud recipient of The Federated Garden Clubs of CT Tribute Award for design. He has exhibited at the Florence Griswold Museum, Wadsworth Atheneum and New Britain Museum of Modern Art. Larry also instructs at Beyond Beginnings Workshop and has embarked on lecture/demonstrations where he enjoys showcasing floral work and speaking. All through his childhood, Larry loved nature. He deeply enjoyed flowers and flower gardening. As a child he would look at flowers, grasses, leaves, and mosses, and think of ways to create something from them. He always loved to emulate the local florists, making floral designs or just fun things that seemed attractive. Even though his professional background is in the food service industry, preparing confectionary masterpieces, designing ice, butter, and tallow carvings or orchestrating social events for clients, creativity was always the drawing factor. Larry’s innate talent for crafting things also led to floral design freelancing of weddings and other social events and even to funeral pieces. Larry’s hobbies include creative floral design, watercolor painting, crafting, and sewing. His husband, Mark Shiley and fur baby, Trevor, provide support. Mark offers critical comments and advice. Connecticut is home to many beautiful and unique gardens. 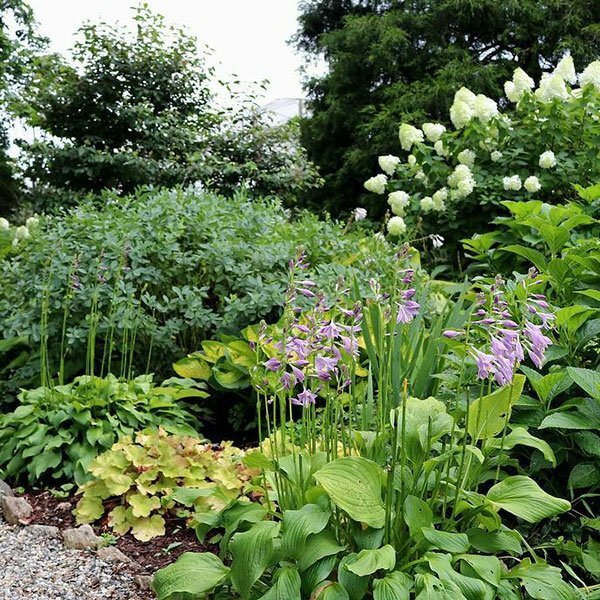 Fifteen historic sites dotted throughout the state have joined to form Connecticut’s Historic Gardens. These delightful places offer visitors an opportunity to explore a variety of garden styles and time periods. Laurie Masciandaro, of founding member Roseland Cottage, introduces you to the history and beauty of these fifteen distinctive historic sites and gardens that have charmed and inspired visitors for a century or more. Every day, the first 1,000 people to purchase an admission ticket at the box office will receive a free copy of Mar Jennings’ first book: LIFE ON MAR’S, A Four Season Garden. 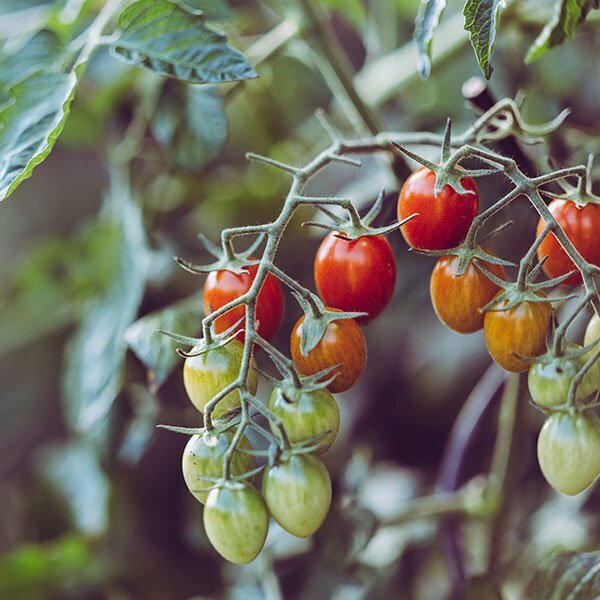 A photographic essay documenting the four seasons of a Connecticut garden, this book provides beautiful design, detail and implementation ideas that are easy enough for novices and interesting enough for seasoned gardeners. Get your free book autographed by attending any one of Mar’s daily lectures at 11 a.m. or 2 p.m.
Five-time Emmy-nominated and Telly Award winning TV Host, best-selling author and award winning Realtor Mar Jennings. Mar Jennings is a Emmy® nominated television show host, entrepreneur, philanthropist and influencer. He is the bestselling author of 2 books, and is known as America’s top lifestyle expert. Millions of people rely on Mar Jennings as a source of useful “how-to” information for all aspects of everyday living—décor, gardening, home renovation and real estate. Currently, the Mar Jennings brand reaches approximately 1 million consumers each month across all media platforms. Mike McGrath is the host of the nationally syndicated Public Radio show You Bet Your Garden produced by WHYY in Philadelphia. The show airs Sundays, at 11:00 a.m., on WPSU-FM. 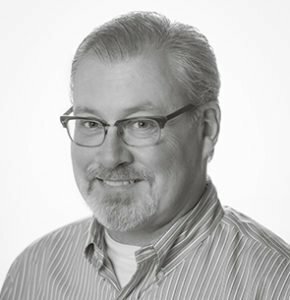 Mike is a contributing editor and columnist for “Greenprints Magazine”, and has also been the garden editor for WTOP News Radio since 1999. Mike is the former editor-in-chief of “ORGANIC GARDENING” magazine from February 1991 through December 1997. During his time at “ORGANIC GARDENING,” Mike’s major exhibits won four consecutive “Best of Show” awards at the prestigious Philadelphia Flower Show (1994-1997). From 1993 through 1997, Mike was the regular gardening expert on the weekend edition of The Today Show on NBC. He has also appeared on Nova, Good Morning America, CBS This Morning, PBS Healthweek, CNN, FOX, and as a regular contributor on the weekly PBS TV series Your Organic Garden and The Discovery Channel’s Home Matters. 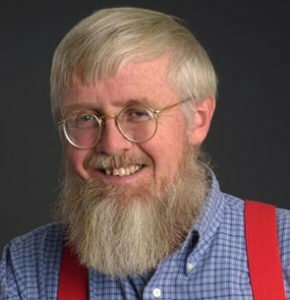 He has authored The Kitchen Garden Box (Quirk Publishing; 2009); Mike McGrath’s Book of Compost(Sterling Publishers; 2006); Kitchen Garden A to Z (Abrams; 2004) and You Bet Your Tomatoes (Rodale; 2002, and reissued in a brand new edition by Plain White Press in 2009). Somehow, Mike still manages to find time to grow tomatoes, garlic, raspberries, and peaches. He loves pinball and baseball; and will not eat lima beans no matter how much you pay him. 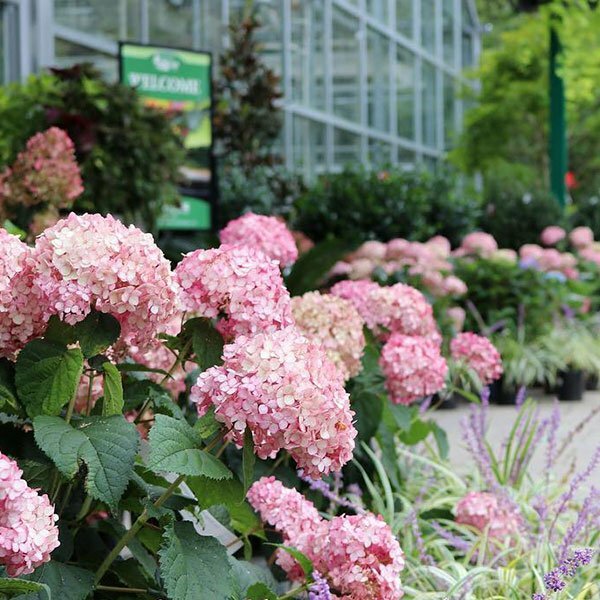 Discover an ecclectic collection of wonderful plants that will thrive in your CT garden. Learn how a garden designer with decades of experience chooses plants for her own garden and those of her clients! The basics of growing happy, healthy houseplants organically taught by a woman who has been doing it since the LAST houseplant boom back in the 70’s! 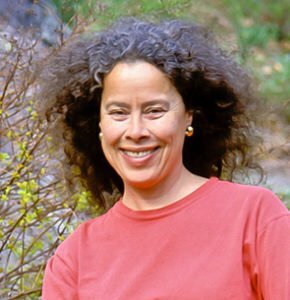 Nancy DuBrule-Clemente is the owner of Natureworks Horticultural Services, an organic garden center, landscape design, consultation, installation and maintenance service in Northford, Ct. Started in 1983, the Natureworks crews and retail store have sold and used only organic fertilizers and pest control products since the business began. Education is the primary focus of Natureworks. 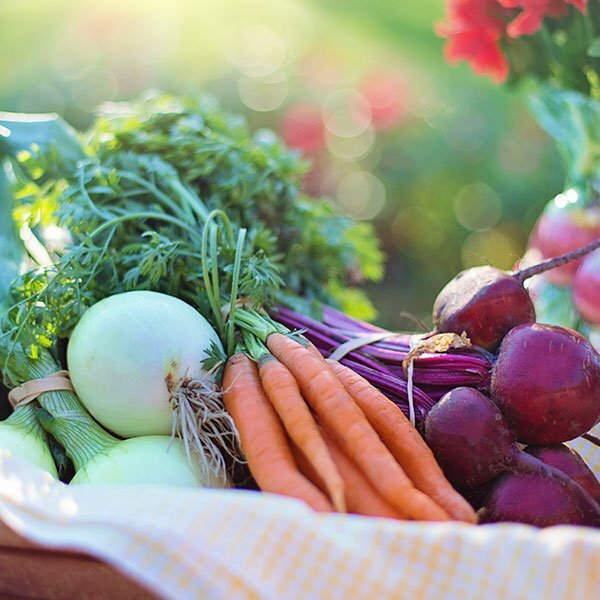 Emails, handouts, website, social media posts and web videos, articles for local newspapers and magazines, talks to groups and radio interviews all combine to spread the word about organic and sustainable practices. Nancy graduated from the Ratcliffe Hicks School of the University of Connecticut with a degree in Floriculture. She is the coauthor (with Marny Smith) of A Country Garden for your Backyard, published by Rodale Press in 1995. She is the author of Succession of Bloom in the Perennial Garden, self published in 2004. 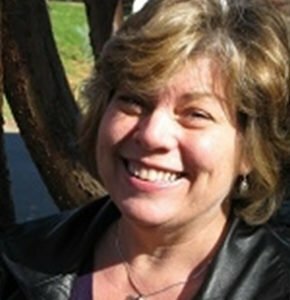 Nancy is also a former board member and past president of NOFA/CT and is currently on the board of the CT. Nurserymen’s Foundation. 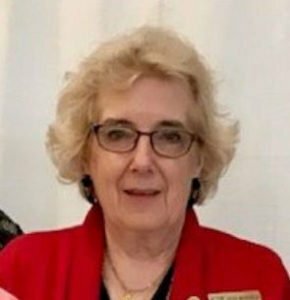 Pamm Cooper works at the UConn Home and Garden Education Center office and was an assistant superintendent at a golf course for over 20 years. She also teaches the entomology and turf portions of the Connecticut Master Gardener Program. 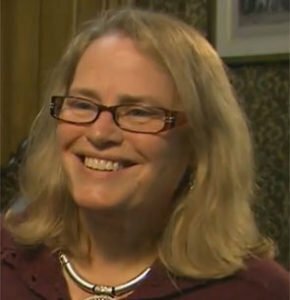 She worked for Dr. David Wagner (evolutionary biologist at UConn who specializes in Lepidoptera), collecting and raising caterpillars for a bio-survey of the Tankerhoosen DEEP property and the Belding Wildlife Management Area in Vernon, Ct.
She has also documented flora and fauna in various areas of Connecticut since 1995. 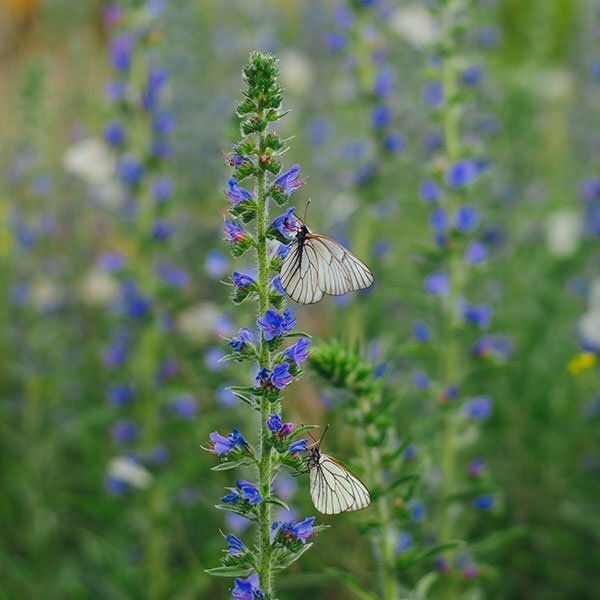 Interests include native plants and insects in the natural and garden environments, birding, nature photography, woodworking and art, especially pen and ink drawing. Pat is a dynamic and engaging speaker who debunks the biggest myths about soil. 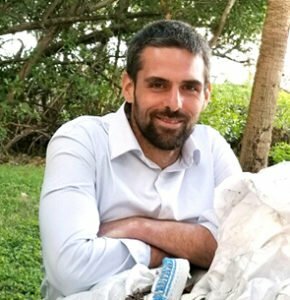 Pat, who served 3 years as a Peace Corps Volunteer in West Africa, has a deep background working in environment, public health, and computer science. 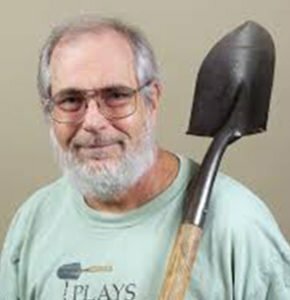 He brings soil to life with captivating stories, insights, useful tips, and interactive audience participation. Pat and his brother, Dan, specialize in teaching the world about and building markets for biochar through Kalanso, the company they co-founded. 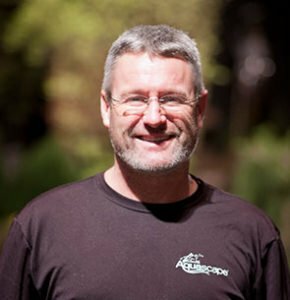 Patrick Comins is executive director of the Connecticut Audubon Society. He is a graduate of Trinity College in Hartford and has worked in the bird conservation field for over 20 years. 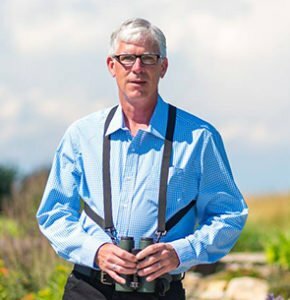 He began his career with the Connecticut Audubon Society undertaking bird surveys at the McKinney National Wildlife Refuge, then as biological technician for the U.S. Fish and Wildlife Service at the McKinney NWR. Patrick then served as the director of bird conservation for Audubon Connecticut for nearly 17 years before coming to the Connecticut Audubon Society. He is a past president of the Connecticut Ornithological Association and has written several articles on bird conservation and identification for The Connecticut Warbler. Patrick is a member of the Connecticut Forest Practices Advisory Board, a position appointed by the Governor and a founding member and past chair of the Friends of the Silvio O Conte National Fish and Wildlife Refuge. 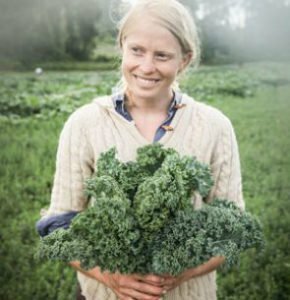 A life-long seed saver and native of the western New York Finger Lakes, Petra Page-Mann has traveled the world studying sustainable agriculture. She has saved countless seeds of organic, regionally adapted vegetables, herbs and flowers to make organic gardening easier and more successful in the Northeast. If she’s not in her garden she’s likely hunting mushrooms, singing or sharing a meal with someone she loves. Renée Marsh is a garden designer, an advanced master gardener, a horticulturist (aka a plant nut) and a flower farmer. She believes our gardens should be a healthy ecosystem where people, plants, animals and insects are in balance. 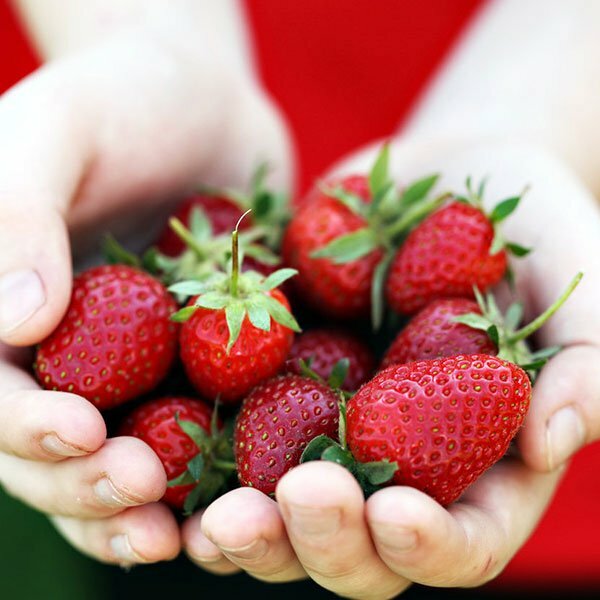 Doing it right means less chemicals, less maintenance and more enjoyment. She is the owner of a gardening design business, A Simpler Place, as well as a horticulture and cut flower business, Hilltop Blooms. She is also the Head Gardener for the Town of Monroe where she designs and manages gardens at the parks and town buildings. She teaches gardening classes for the New York Botanical Garden and adult education programs, speaks to many community groups including garden clubs and writes on gardening topics for local publications. In her spare time she works on her 1803 homestead in Shelton, Connecticut. 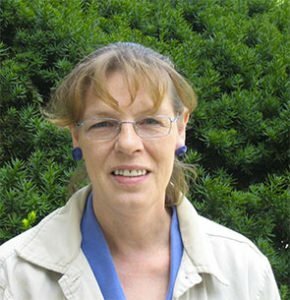 For much more about Renée, her passion for gardening and her blog, visit her website www.ASimplerPlace.com. 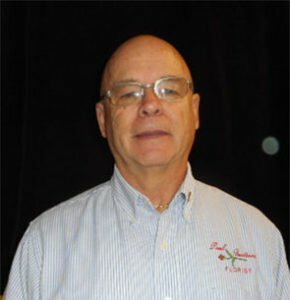 Robert Townsend began his career began 25 years ago with his own landscaping business. Always on the lookout for new challenges and opportunities, in 1991 Rob built his first pond. So satisfying was the planning and execution of this project, his mind was made up to enter a new phase of landscaping design. He began his search for information on Pond Ecosystems. Biologist, gardener, writer and storyteller, Roger Swain was born and raised outside Boston Massachusetts. He graduated from Harvard College, and went on to earn a Ph.D. , studying the behavior in ants in tropical rain forests, before becoming Science Editor of Horticulture magazine. Since 1978 readers have been enjoying Roger’s essays and articles, as well as his five books Earthly Pleasures, Field Days, The Practical Gardener, Saving Graces, and Groundwork. When he is not talking with gardeners across the country, Roger can be found at work in the orchard and gardens of his New Hampshire farm. Steve Walowski is co-owner of Hillside Landscaping and HLC Organic. He founded the company in 1984 upon graduating from Delaware Valley University, with a degree in Ornamental Horticulture. For over three decades Steve and co-owner John Wilcox have been creating award winning, custom landscapes for the people of Connecticut. After years of experimentation with methods and products of organic lawn care on their own lawns, Steve launched HLC Organic, a company dedicated to creating and maintaining beautiful lawns in Connecticut using safe, science based, and chemical free strategies. Following her mother’s interest in flowers, Trish Manfredi took flower arranging as a 4-H club member in Maryland, giving flower arranging demonstrations as a teen-ager. That began a life-long interest in floral design. Today, Trish is an National Garden Club Accredited Flower Show Judge and chair of the Connecticut Judges Council, after serving as design chair for five years. She received the CT Federation of Garden Clubs Tribute Award for Design in 2012, and has been chair of judges for the CT State Flower Show for four years. Her designs have been published in NGC’s Vision of Beauty Calendar 2013 & 2014. She received the People’s Choice Award at the 2013 Fine Arts and Flowers, Wadsworth Atheneum, Hartford, and has won the Table Artistry Award three times at the Connecticut State Flower Show. She has been an invited designer at Fine Arts and Flowers for the New Britain Museum of American Art and the Florence Griswold Museum in Old Lyme for Blooms with a View. In 2015, Trish was an invited designer for floral challenges at the Springfield, Massachusetts Quadrangle Museums, and at Wadsworth Atheneum as part of Fine Arts and Flowers events in 2015 and 2016. She demonstrates flower arranging and judges flower shows throughout New England and NY State. She is a member of Country Gardeners of Glastonbury Garden Club and Creative Arrangers of Connecticut. Trish retired from Cooperative Extension at the University of Massachusetts, and then worked at UConn until recently. She holds a doctorate in Educational Research. Along with her husband, she fosters cats for Siamese Cat Rescue and they also own Domestic Cow Antiques and Events.